As a journalist and former editor in chief of Teen Vogue, Elaine Welteroth is used to being the one asking the hard-hitting questions. But last week when Elaine joined Malala on her recent trip to Brazil, we thought it would be fun to switch gears and have Malala lead the interview. Turns out Malala wasn’t going to let her off easy. “She’s hard, man! She’s a hard journalist,” Elaine remarked as Malala asked her about finding your voice, navigating social media and advice for young journalists. While at Teen Vogue, Elaine helped transform the glossy style mag into a socially-conscious soapbox for young girls. As an activist and writer, Elaine continues to give teens a platform to voice their opinions on issues that matter to them. Earlier this year, she hosted a TV special featuring the survivors of the school shooting in Parkland, Florida. 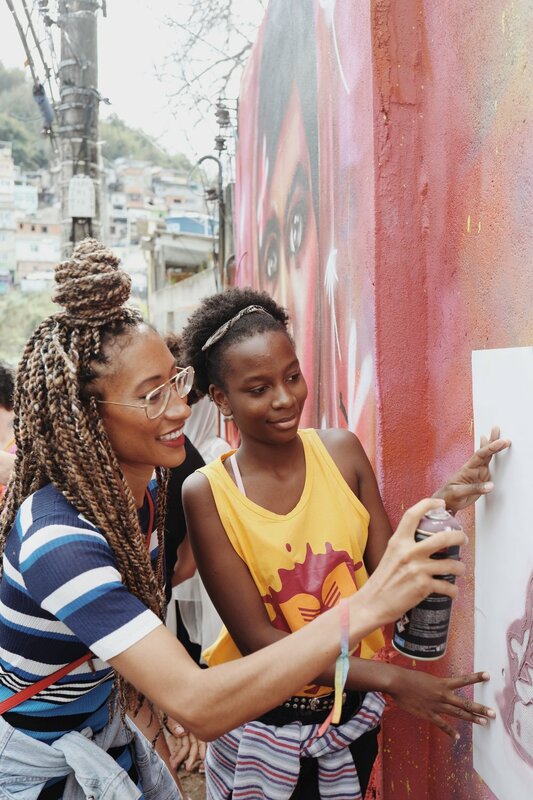 While in Brazil, Elaine travelled with Malala to meet indigenous and Afro-Brazilian girls and learn about the barriers they face — like discrimination, violence and poverty.